Carte de l'Europe en 1789. Carte de l'Europe en 1813. A fine first edition example of M. Lapie's maps of europe in 1789 and 1813. 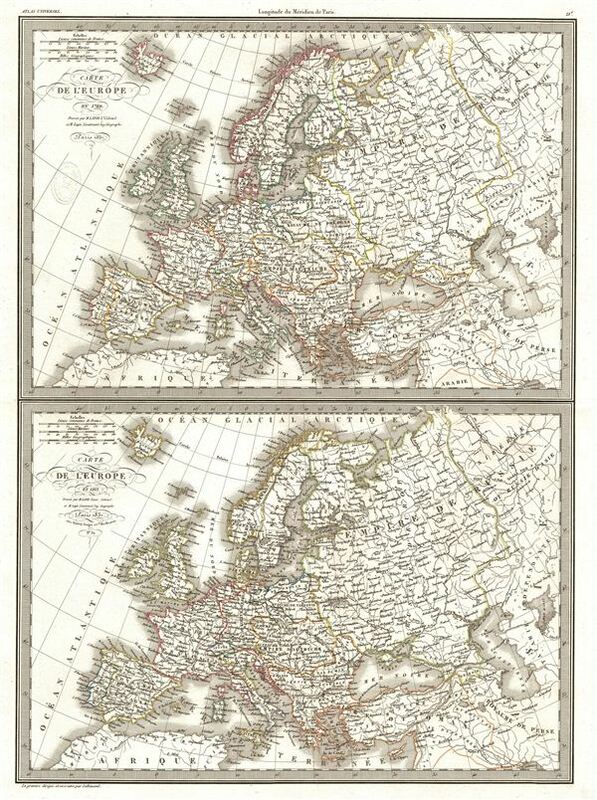 The sheet is divided into two parts: the upper half maps europe on the eve of the 1789 French Revolution; the lower half maps Napoleonic europe in 1813, two years before his final 1815 defeat at Waterloo. Both maps cover europe from the Atlantic Ocean to the western edges of Siberia and Independent Tartary, and from the Persia in the east to northern Africa in the west. Comparing the two maps reveals Napoleon's consolidation of all of western and northwestern Italy into expansionist French empire, the transformation of the German 'empire D'Allemagne' to the Napoleonic dependent state 'Confederation Du Rhin' [sic], and the annexation of Lithuania and much of what would become Poland into the Russian empire. This map would make a fine companion map to Lapie's other historical maps of europe from the same atlas. engraved by Armand Joseph Lallemand as plate no. 21 in the first edition of M. Lapie's important Atlas Universel. This map, like all maps from the Atlas Universel features an embossed stamp from the Lapie firm. Rumsey 2174.021. Phillips (Atlases) 754, 765.